– Oeler Industries, Inc. | Acoustic, Noise & Sound Control Specialists – Pittsburgh, PA. In today's modern society architectural acoustics is important in allowing us to live and work in a more pleasing and productive environment. Industrial Acoustics is important for controlling noisy equipment and machinery in the industrial workplace, increasing safety and productivity. Noisy construction sites need to be quieted to meet local municipal codes and improve worker safety and exposure to noisy equipment and high sound levels. With the increase of oil and gas production in urban areas, environmental impact has become a critical issue with emphasis on noise control at drill and pump sites. Exposure to excessive noise can damage hearing, and it is important to understand the effects of this kind of noise exposure and its effects. Sometimes an acoustic or noise control issue is just simply more than you can handle. Let our 20 years experience help you achieve success with your project. Consider what your environment sounds like … or doesn’t sound like. Whether your workspace is a corporate office or a heavy industrial facility, excessive noise can be distracting and dangerous. At Oeler Industries, Inc., we understand that a comfortable acoustic environment contributes greatly to productivity and safety. We also understand the challenges of achieving those objectives. With an appreciation for aesthetically pleasing designs and detail, we will customize a solution for you. To solve a particular noise issue, it is important to first know the basics of how sound works. There are three ways to control sound, Absorption, Blocking, (sometimes referred to as “soundproofing”), and Coverage. Acoustic absorption refers to a material, structure or object absorbing sound energy when sound waves collide with it, as opposed to reflecting the energy. Part of the absorbed energy is transformed into heat and part is transmitted. Absorption materials are typically used to treat reverberant spaces. Sound Blocking is commonly called sound proofing and is used to block sound from transmitting into adjacent areas or workstations. In general, if the source of unwanted sound is generated in another room, space, or from the outside and is transferring through a wall, ceiling, or floor into your space, then you need sound blocking products. Sometimes it is impossible or impractical to block or absorb unwanted noise. In those instances, sound masking is used to “cover” the unwanted sound. Sound masking is the addition of natural or artificial sound (such as white noise or pink noise) into an environment to cover up unwanted sound by using auditory masking. 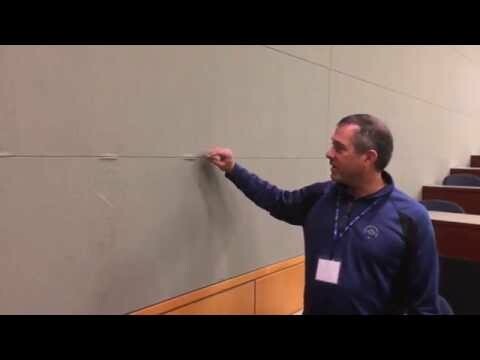 Matt Oeler of Oeler Industries, Inc. demonstrates the durability of The Novawall Stretch Wall Fabric System. Dan O'Brien of the Industrial division of Sound Seal in Agawam, MA explains the different Industrial products offered by Sound Seal.